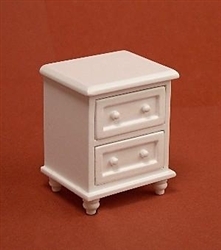 This Night Stand is simple but maintains the same elegant style. Finished is painted white. The piece includes two recessed panel drawers with matching wooden knobs. The timeless style will coordinate with any style of decor. This piece also looks good as an end table in a living room or den.